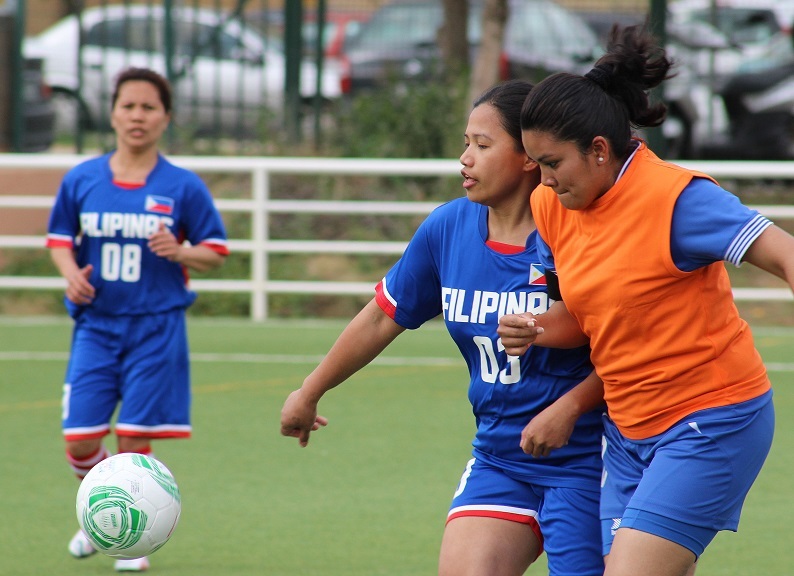 A Filipino Women’s Football Team participated in the First Ibero-American Women’s Football Tournament held in Sevilla, Spain from 23 to 24 April of this year. The tournament was part of the activities organized by the City Council of Seville in collaboration with the different consulates in Seville (including the Philippine Honorary Consulate) headed by the Consulate of El Salvador. Other collaborators included the Municipal Institute of Sports, Royal Spanish Football Federation, Central de Devoluciones Farmacéuticas (CEDIFA), El Corte Inglés, Food Bank and others, which provided financial support for the said event. The tournament was attended by representatives of the City Council, including Mr. Jesús Carrillo Espinoza, (member of the Cultural Section of the City Council of Seville), as well as consuls of the participating teams: Consul of Ecuador, Mr. Héctor Salgado Rodríguez; Consul General of Bolivia, Mr. Raúl Alberto Castor Cuéllar; Consul of Peru, Ms. Lucía Trindade de Buitrón; Consul of El Salvador, Mr. Ignacio de Cossío Pérez de Mendoza; Consul General of Colombia, Ms. Lucía, Madriñán Saa; Consul General of the Philippines, Mr. José Ignacio Bidón y Vigil de Quiñones; and representatives of different associations from the said participating countries. In addition to the football matches, parallel activities were also held during the event, which likewise counted on the participation of the communities from the participating countries. The eight participating teams were Ecuador, Bolivia, Paraguay, Peru, El Salvador, Philippines, Nicaragua and Colombia. The Philippine team played against El Salvador. The latter won the game, but the Philippine team won the hearts of the spectators and tournament attendees. Proof of this was that it received the Best Fans and the Fairest Team Award. The Honorary Consul of the Philippines in Seville, Mr. José Ignacio Bidón y Vigil de Quiñones, and the President of the Consular Corps of the said city, conferred on the team the said awards. The tournament was likewise attended by a big group of Filipinos who cheered for the Philippine team with chants and other activities. The teams of El Salvador and Ecuador were the ones that made it to the finals, at the end of which, Ecuador emerged as the overall champion. The champion’s trophy was given by the representative of the City Council of Seville. The event was broadcast through all types of media in different local and Andalusian TV channels.